The month of March is “National Nutrition Month” as well as “Brain Injury Awareness Month” and what better way to celebrate than with cooking up this delicious recipe! Its ingredients not only pack their own nutritious punch, but they are essential for optimal cognitive function and overall brain health. Salmon, especially fresh, wild salmon, is high in a particular group of fats known as omega-3 fatty acids. Omega-3 fatty acids are one of the most beneficial nutrients for your brain. The two most important omega-3 fatty acids are docosahexanoic acid (DHA) and eicosapentanoic acid (EPA), and because the human body cannot make these important nutrients, they have to be obtained through food. DHA represents one of the most abundant fatty acids found in the brain. It contributes to building brain cell membranes, reducing brain inflammation, and promoting new brain cell formation. It is the primary structural component of the cerebral cortex, the area of the brain responsible for memory, language, creativity, judgement and emotion. In fact, low DHA levels have been linked to depression, memory loss, and bipolar disorder. Omega-3 fatty acids can be found in fatty fish, such as salmon, tuna, and halibut, as well as some nuts and seeds, such as walnuts, chia seeds and flax seeds. The salmon isn’t the only star of the show in this recipe! The spinach, garlic, lemon, and olive oil as well as the variety of flavorful spices provide a hefty dose of antioxidants. In the body, antioxidants block harmful chemical reactions caused by oxidation – the destructive effect of oxygen on the structural components of cells. During oxidation, oxygen compounds are converted to unstable, reactive compounds called free radicals. These free radicals can cause damage to cell DNA and cell membranes. Antioxidants act as “free radical scavengers” to prevent and repair the damage done by free radicals. Because all cells require oxygen, every cell in the body is affected by free radical damage. Brain cells are particularly vulnerable because brain cells consume more oxygen than any other organ! Therefore, increasing antioxidant intake in the diet can be an important step towards protecting the brain from oxidative stress and inflammation. Antioxidants are present in fresh fruits and vegetables, as well as many herbs and spices. Fruits and veggies that have bright, distinctive colors such as red tomatoes, purple blueberries, yellow corn, and orange carrots are rich in antioxidants. So whether it’s the salmon (omega-3 fatty acids), and olive oil (vitamin E), or the baby spinach (vitamin A) and lemon (vitamin C), this dish is no slouch in its impact on your brain health! Cook it up for an easy, delicious weeknight dinner and your family (and brain!) will thank you. 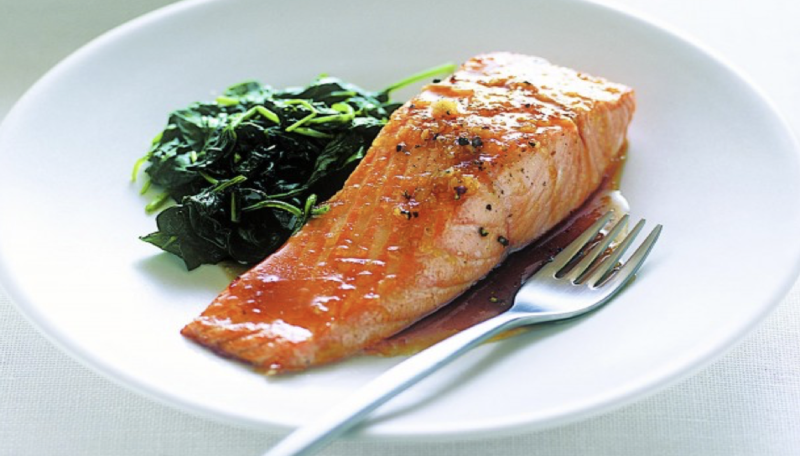 To prepare salmon, combine first 6 ingredients; rub spice mixture evenly over fish. Place onion in an 11 x 7-inch baking dish coated with cooking spray. Place fish on top of onion; bake at 400° for 20 minutes or until fish flakes easily when tested with a fork or until desired degree of doneness. To prepare spinach, heat oil in a large nonstick skillet over medium heat. Add garlic to pan; cook 1 minute. Add half of spinach; cook for 1 minute, stirring frequently. Add remaining spinach; cook 4 minutes or until wilted, stirring frequently. Sprinkle spinach mixture with rind and 1/4 teaspoon salt. Stir in juice; remove from heat. Place salmon on a platter. Arrange onions and spinach evenly around salmon. Sprinkle salmon with chopped fresh cilantro. Serve with lemon wedges, if desired.